In the summer of 2009, I sat down and took the time to double-side print Dragon’s Future, Dragon’s Heir, Dragon’s Revenge, and Dragon’s Cure from my HP inkjet printer. Then I three-holed punched them all and put them into a report folder with those irritating brads. I handed the book to a friend to read. She passed them on to her husband and son. They all enjoyed them. That was when I first began thinking of a cover for the books. So, in September of 2013, I began drawing a cover concept for Dragon’s Future. I had Ruskya, the main character, staring off into space, and Wyeth, his dragon, behind him spraying him with dragon courage, a sparkly dust that gives courage. In April of this year, when we began talking about the cover for the book release of Dragon’s Future, both my book manager, Pam, and I liked the idea of using the spraying of dragon courage. So, I then turned to my cover artist, Amy Chitulescu, to do her magic. I had seen her deviantart page and fell in love with! The cover speaks for itself. 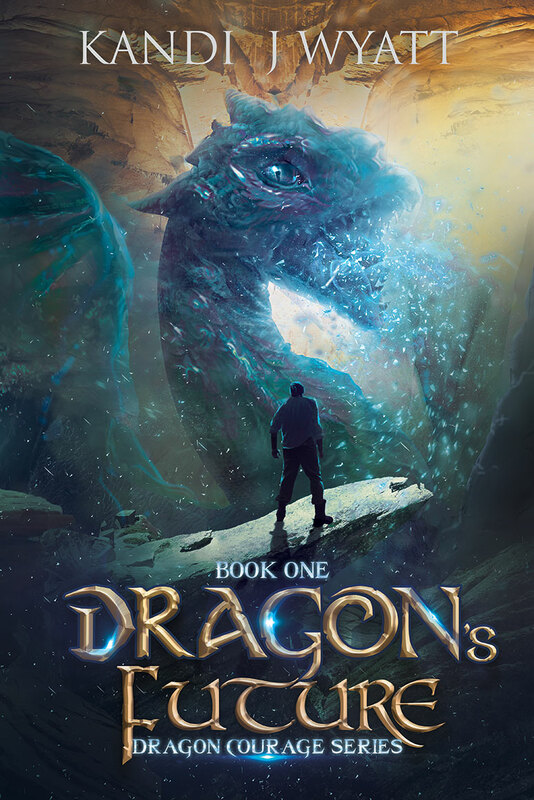 Follow Ruskya’s quest in this exciting young adult fantasy series by new author Kandi J Wyatt. The book will go on pre-order at amazon soon. It will be released on August 10th.